You are playing around with the KARMA sliders for the drum module of a combi and find a really cool KARMA-generated drum groove. You want to capture this groove in the internal sequencer and turn it into an user drum pattern that can be used in any drum program (or combi). (optional) While in COMBI mode, play around with the KARMA RTC settings for the Drum module until you have the Drum groove exactly the way you want it. Use the auto song setup feature to move the combi into the internal sequencer. On your M3, hold down the ENTER button and press the REC/WRITE button. 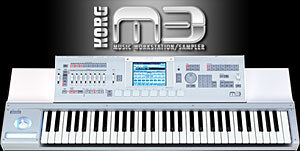 The M3 automatically switches over to SEQuencer mode. All the programs 1-16 of the combi are loaded into the next available empty song in the internal sequencer as tracks 1-16 of the song. The KARMA RTC settings for the Drum module (and the other three modules) are still exactly the same as you set them when you were in COMBI mode. Record enough measures to capture some good drum material to choose from. Note that most KARMA-generated drum patterns play a "fill" (drum break) every 8 or 16 bars. Ensure that the KARMA button and the LATCH button are both lit. After you've captured enough measures of the KARMA-generated drum groove, press START/STOP again to stop recording. Play the song a few times and figure out which tracks and which measures contain the phrase that you want to capture. Carefully note which measures contain the entire phrase that you want to capture as a user drum pattern. For example, you might really like the four measures from 009 to 012. Capture the phrase to a user pattern in the song. Press PAGE SELECT and go to the P10 Pattern/RPPR page. From the page menu, select Pattern Parameter. A Set Pattern Parameter of U00 popup appears. In the Length field, specify the total number of measures in the phrase that you want to capture. From the page menu, select Get From Track. A Get to Pattern U00 popup appears. In the Track field, specify the track number that contains the drum groove that you want to capture. In the Measure field, specify the starting measure of the phrase that you want to capture. Touch OK. The note data is copied from the specified measures of the track into user pattern *U00* of the song. From the page menu, select Convert To Drum Trk Pattern. A Convert to Drum Track Pattern popup appears. The To field is already populated with the first available empty user drum pattern in the M3's internal memory. (optional) In the To field, touch the > icon and select the user drum pattern number into which you want to write this pattern. (You can overwrite an existing drum pattern this way.) Make a note of this pattern number because you'll need it in a subsequent step. Ensure that the All Patterns available in Song nnn checkbox is cleared. Ensure that the Note Only checkbox is selected. Touch OK. The system briefly displays a message that the drum pattern is being written to memory. Verify that your new user drum pattern has been saved and is working correctly. Switch to PROGRAM mode and choose any program. On the Main tab of the P0 Play page, select your new user drum pattern for the program's drum track. In the DRUM TRACK section, touch the > icon at the immediate right of the Pattern field and select User. Ensure that the DRUM TRACK ON/OFF button on the M3 is lit. Play some notes. You should hear your captured user drum pattern being played at the tempo of the program with the drum kit specified in the program. If you begin with Step 4, this general procedure also works with songs that you've already recorded.